I can’t write much because I seriously need to beat 4-1 in Demon’s Souls right now. I plan to write at length why I think this game is a revelation, and maybe more regular musings on music, games and movies if people actually read it. I’m in the middle of busy things at work and in my music… And I don’t have much time to work on Amnesia at the moment – but I’m still using every lunchbreak to do a little painting of the backdrops. 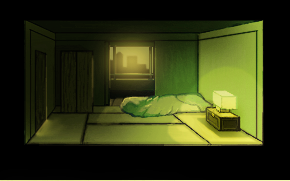 So, now I’ve got the street done, I decided to look back at the room again to bring it closer in style. I’ll be back with a piece about Demon’s Souls soon.